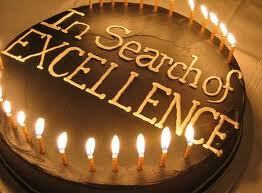 What do you think of in regards to pursuing excellence? 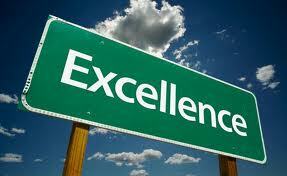 Is excellence a state you achieve, a destination where you arrive, or the journey itself? If excellence is peak performance, can it be sustained indefinitely? And if not, why not? If so, is peak performance static or dynamic? These are some of the questions I’ve been wrestling with today as I finished reading an excellent book called Deep Change: Discovering the Leader Within by Robert E. Quinn. If you’re looking for a good read, you might consider picking up this book. While the book discusses a wide variety of topics such as empowerment, innovation, change, paradigms of management and more, I wanted to focus tonight on its consideration of excellence. 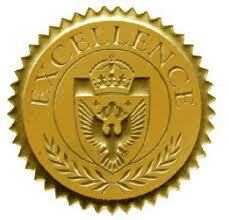 Whether you’re a mom, coach, teacher, factory worker or student, we all aim for excellence. Colossians 3:23 instructs us in fact that “whatever you do, work at it with all your heart, as working for the Lord, not for human masters.” In all things, we are to work heartily, desiring to please our Savior. That certainly encourages me to pursue excellence in all that I do. Excellence, however, according to Quinn is not some arbitrary level to attain, but rather a dynamic state. In fact, excellence or peak performance cannot be expected and sustained indefinitely. Consider an athletic team. Even the best professional team cannot play with the same level of intensity and performance throughout an entire contest. And even when excellence is achieved, we must then construct a new definition or understanding of excellence for future endeavors. Excellence cannot be achieved in the same way every time. For me personally, this speaks to the idea that I must constantly be reinventing and improving myself – whether I’m speaking, writing, parenting or even in my personal walk with Christ. Risk and learning guard the gates of excellence, and can only be overcome with faith and courage. Excellence is not achieved by a simple checklist and definitive strategy, but rather through intentional unique approaches. As you look around at our world, how many people, organizations or systems would you characterize as excellent? The percentage is actually quite low. Why is that? According to Quinn, excellence is a form of deviance! Normal, regular or standard behavior is status quo. It is excellence that goes above and beyond normalcy. If you want to become excellent, you must choose to do things normal people don’t want to do. That journey can often be risky, painful and generally unappealing to others. In pursuing excellence you will also meet significant resistance. Even when excellence is achieved, resistance doesn’t subside. This realization contradicts everything I have always thought. Naively I assumed that when an endeavor is proved not only successful, but excellent, people will recognize and embrace it. According to Quinn, this is not the case at all. Finally, excellence is sought after because it’s the right thing to do, and in so doing, one achieves internal satisfaction. The excellent way, however, isn’t easy, pain-free, or even appealing to the masses. This reminds me of something one of my seminary professors, Jason Clark, said last semester in regards to Jesus’ teaching. Although Jesus taught multitudes, only a few became disciples. Only a few people today will pursue excellence. Doesn’t this thought add depth to Matthew 7:13, “Enter through the narrow gate. For wide is the gate and broad is the road that leads to destruction, and many enter through it”? What is the narrow gate you’re pursuing? How do these thoughts about excellence challenge your current thinking and understanding?